Entire plant rather fleshy; stems short, five-angled, 4 to 12 inches high from a short rootstock provided with numerous fleshy roots. 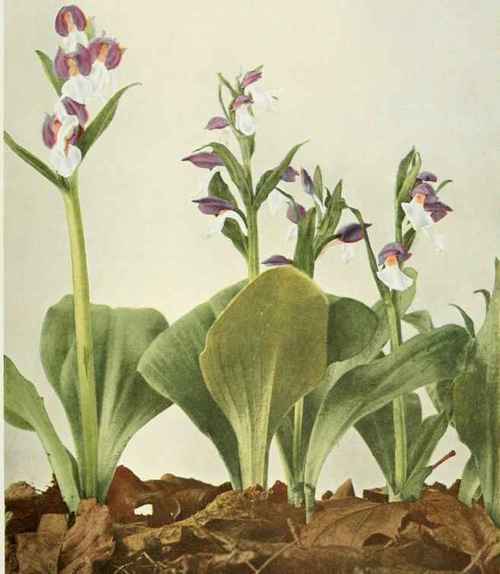 Leaves two, near the base of the stem, obovate, dark glossy green, 4 to 8 inches long and 2 to 4 inches wide, clammy to the touch; the three to ten flowers in a terminal spike, each flower about 1 inch long, violet-purple mixed with lighter purple and white, the subtending bracts sheathing the ovaries; sepals united above forming a hood; petals connivent under the sepals and more or less attached to them; lip whitish, wavy, produced into an obtuse spur, about as long as the petals; column short, scarcely extending above the base of the lip, violet on the back. In rich woods, New Brunswick to Ontario, Dakota, Georgia, Kentucky, Missouri and Nebraska. Flowering in May and June or as late as July in the extreme northern part of its range.